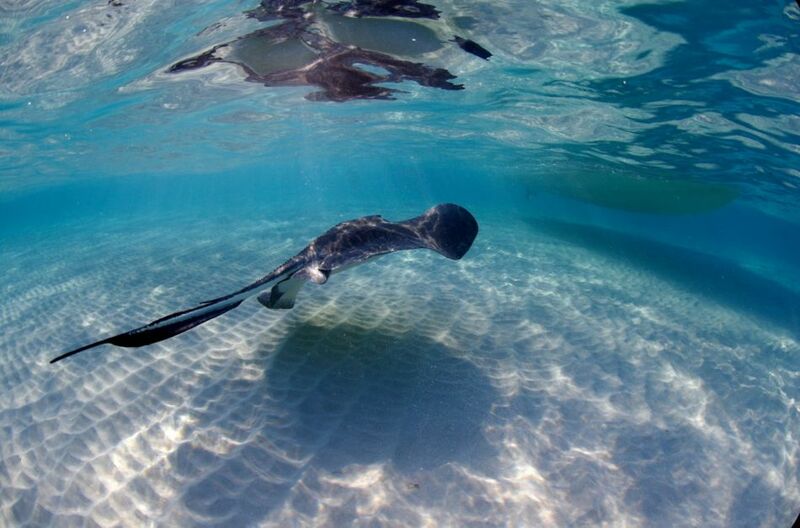 We run Stingray Snorkel Trips to the Sandbar during more civilized hours at 1:30PM on Thursday and Fridays. These trips are great for families or people who are diving in the morning. 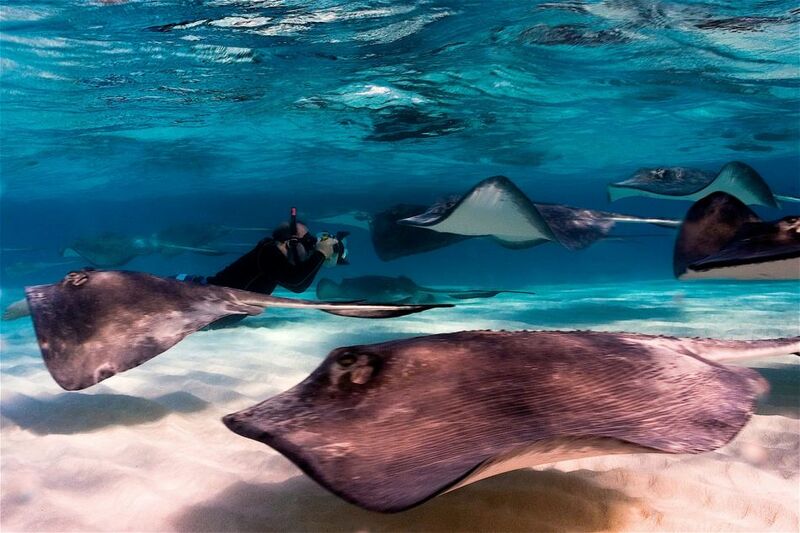 Always lots of friendly Stingrays, amazing photo opportunities and memories of a lifetime. 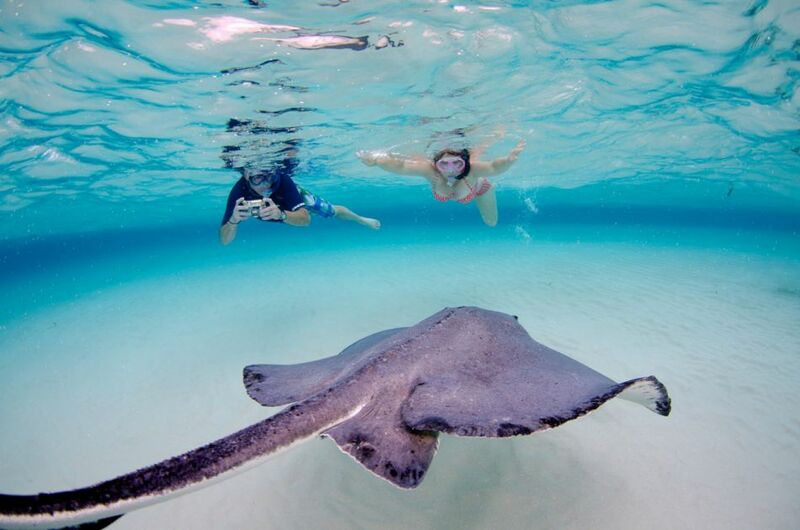 We consider the best way to interact with our Stingrays is by Snorkeling at the Sandbar in Grand Cayman's North Sound. 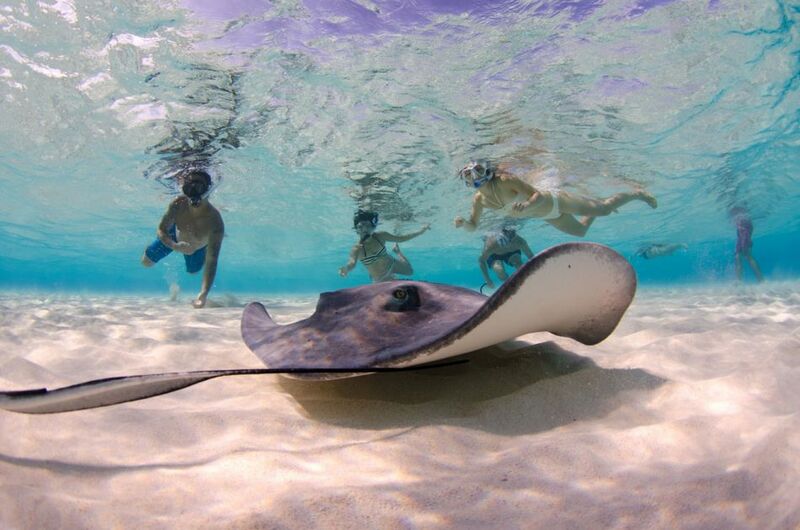 You will see and interact with more Stingrays when snorkeling than diving. It is also a great activity for divers and non-divers to go on a trip together. 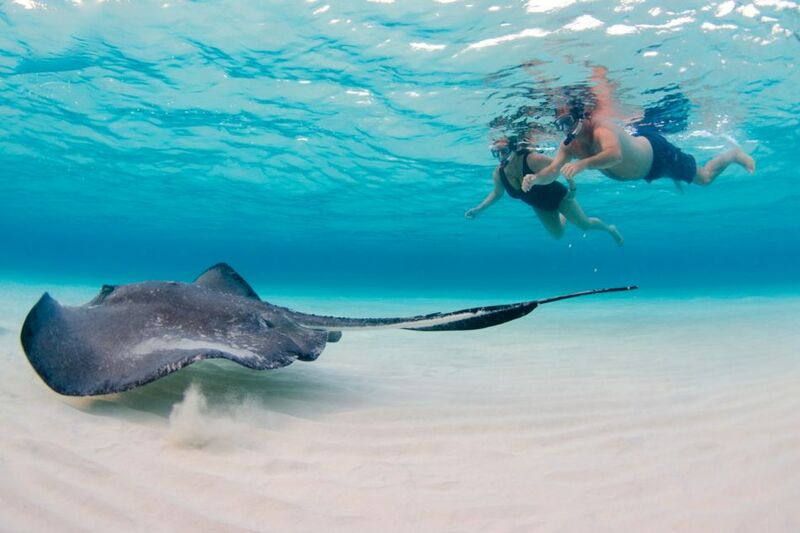 Considered by all the must see and do when visiting the Cayman Islands. 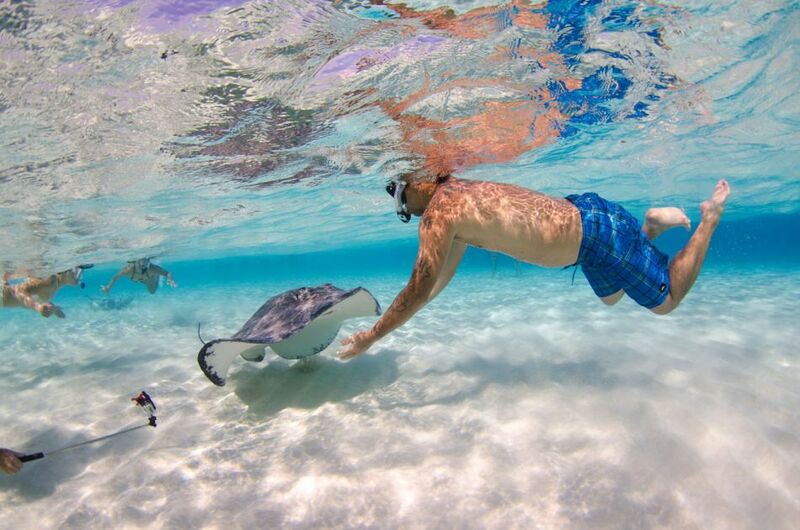 Kiss a Stingray and you'll have 7 years of good luck. 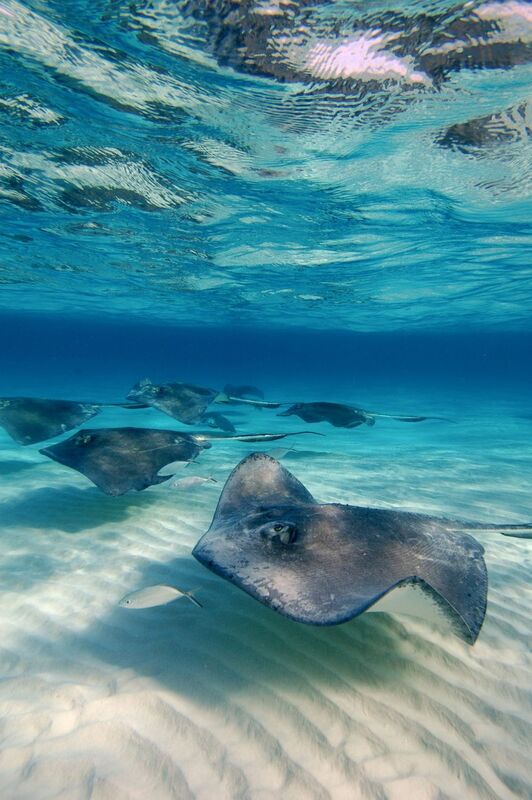 Friday is a good day to visit the Stingrays as it is typically the day of the week that has the least amount or no Cruise Ships in Port. Another reason Friday works for our customers is that many are flying on Saturday and a snorkel trip does not effect their flying after diving time interval requirements. "6A. 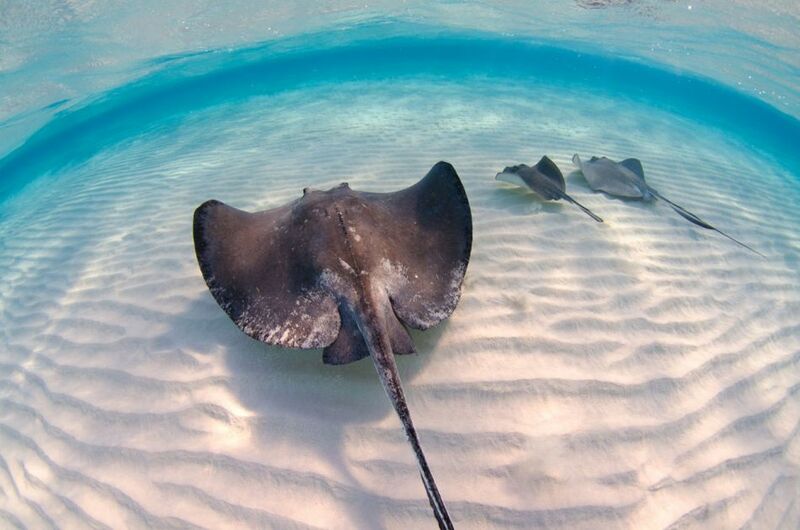 (1) This regulation applies in respect of both the Sandbar Wildlife Interaction Zone and the Stingray City Wildlife Interaction Zone described in the Fourth Schedule. (e) feed any stingray or other marine life with food of a kind other than a kind approved by the Board. (3) Paragraph (2)(a) does not prohibit wearing of flippers while snorkelling in water deeper than four feet." "9. The owner of a boat shall not permit the boat to be used as a tourist boat for the carriage of passengers to or from a wildlife interaction zone unless a licence is in force under this Part in respect of the boat." Stingray Sandbar Location shown on Map below, marked by green line. 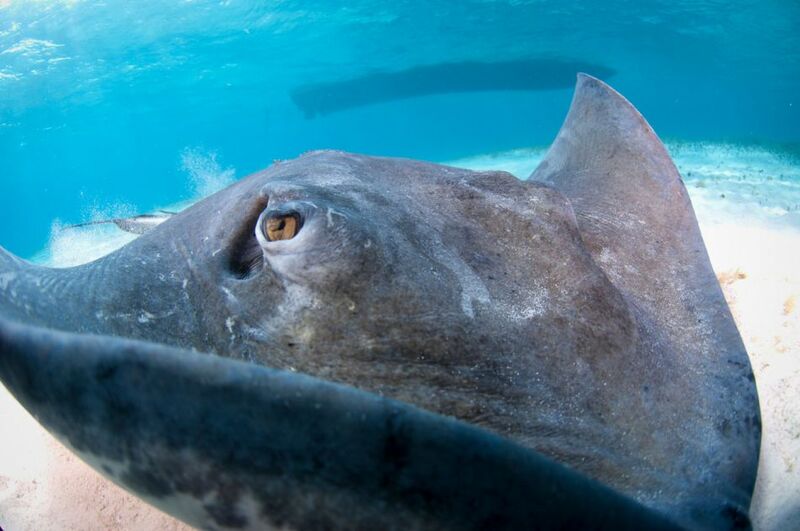 Worldwide there are 340 species of rays, which are classified (along with their relatives sharks) as Elasmobranchs, distinguished from other fish because their skeletons are made from mainly cartilage rather than bone. 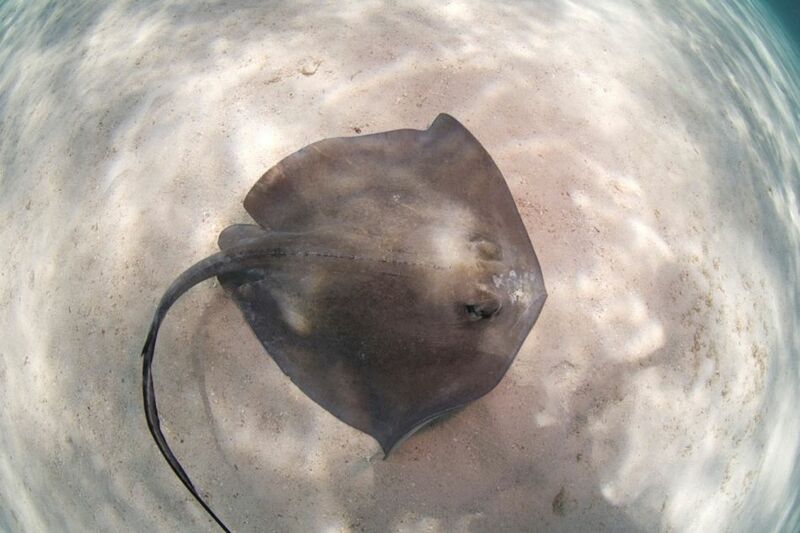 The rays at the Sandbar are Southern Stingrays (Dasyatis americana). 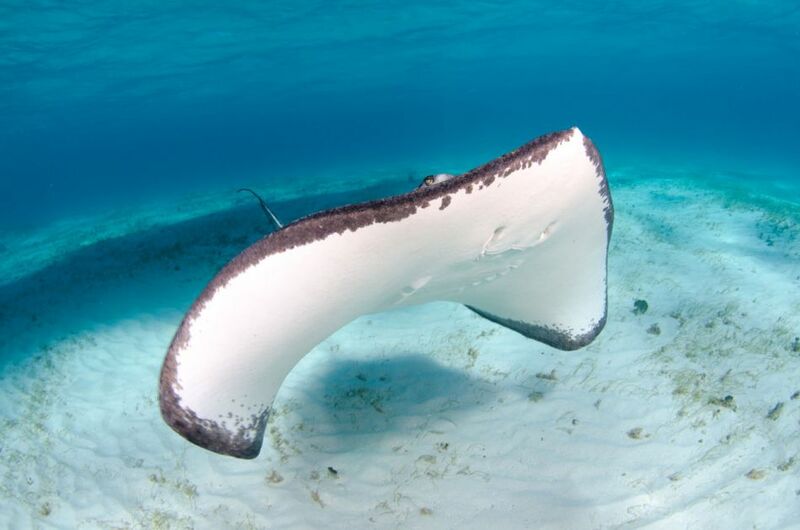 Stingrays are so called because of the barbed spine, with an associated venom gland, which they have on their tail. They use this spine to defend themselves from their main predators - sharks. This strategy is not always successful: one Great Hammerhead Shark was found with 96 indigestible Southern Stingray barbs in its stomach! Their wide flat body is an adaptation for life on the seabed. 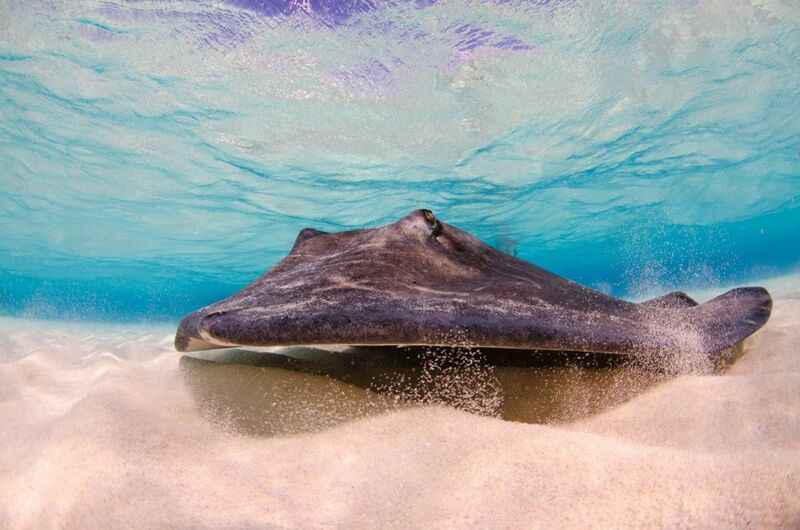 Stingrays are masters of disguise and spend much of their time buried in the sand with only their eyes poking out. 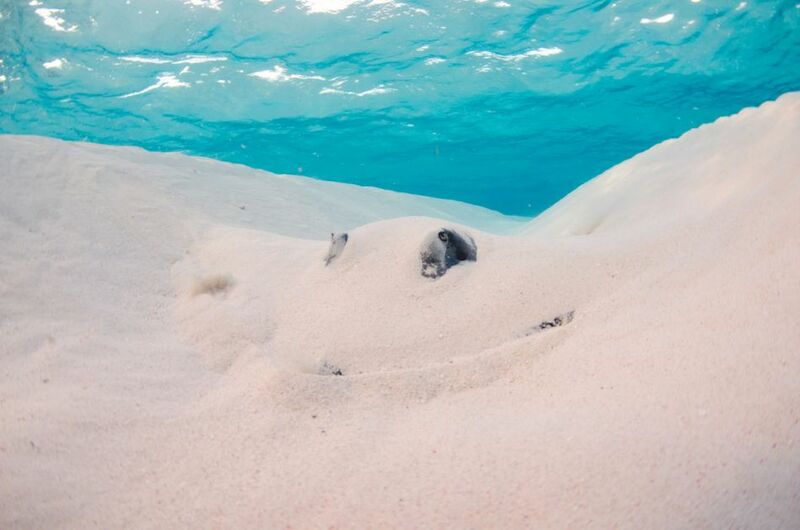 Next time you are diving at Stingray City/Sandbar search the sand carefully and you may see an imprint of where a ray has been lying, left behind rather like a snow angel. 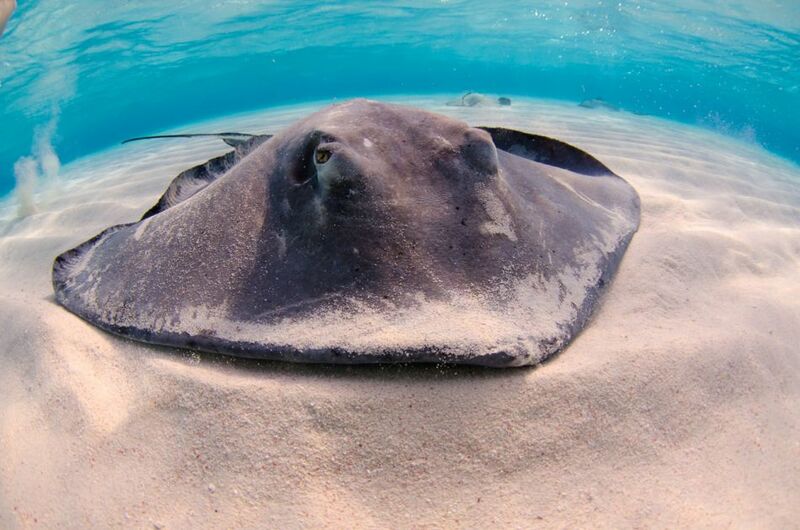 Spiracles, which are openings behind the eyes, enable stingrays to breathe when their mouths and gills are buried. 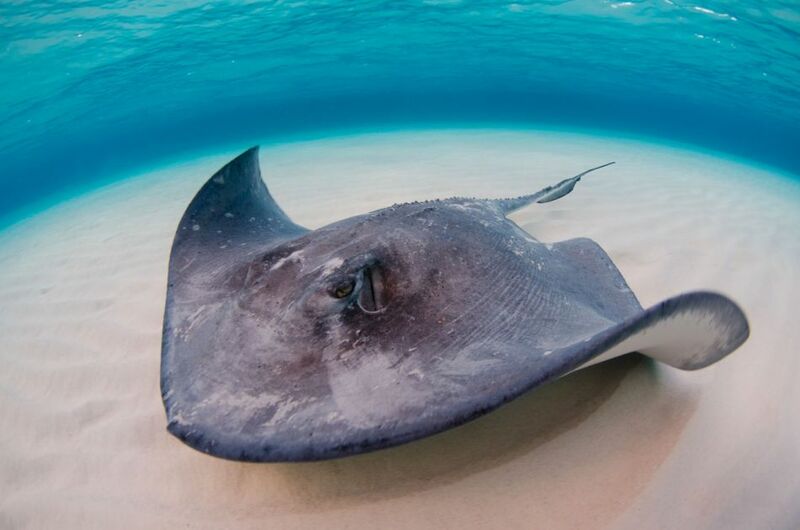 In the last few years we have learned much more about the stingrays from a new study by the Guy Harvey Research Institute. 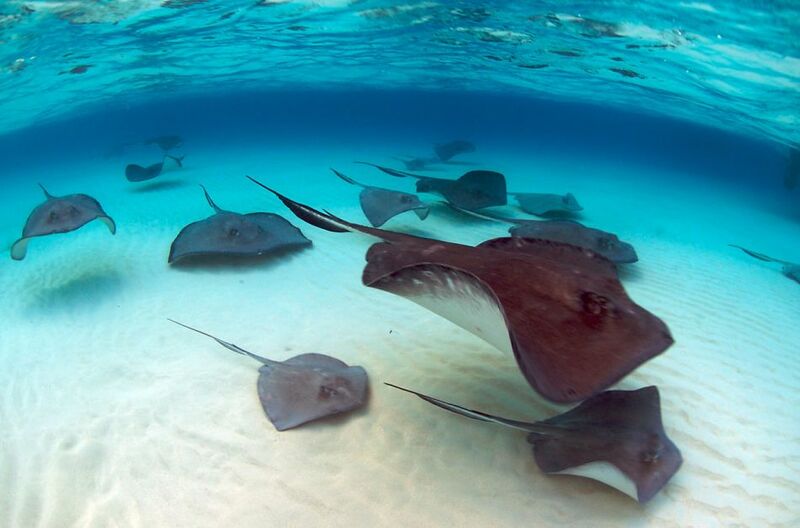 This research estimated there to be about 140 stingrays at Stingray City / Sandbar, although they are rarely all there at once. 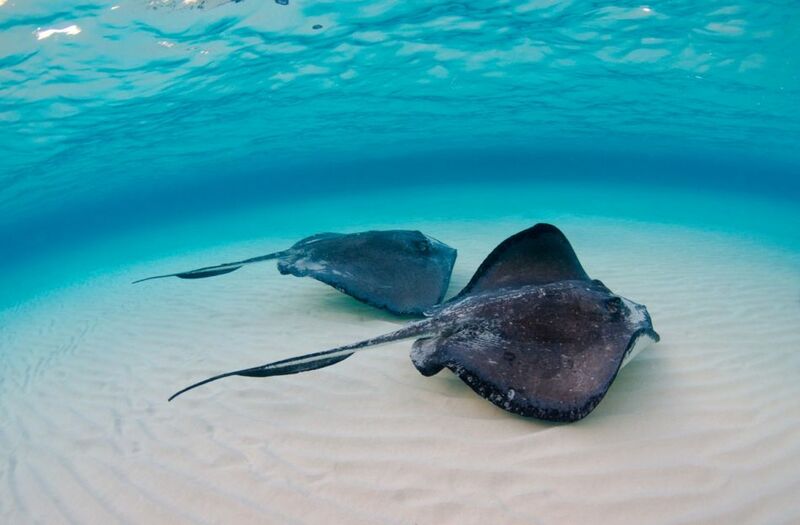 There are far fewer rays at the smaller original Stingray City, and rays do not frequently move between the two sites or mix with the island’s other stingrays. The larger stingrays in the North Sound are females and between February and September many of them are pregnant. During this time they usually stay close to the feeding sites, eating as much as possible which helps their young grow. The smaller males wander further for their meals, probably unable to compete for handouts with the larger females. The males mature when they span 1.5 feet (50cm), many of the females grow to reach 5 feet. When it is time for them to give birth the females probably swim into shallow water by the mangroves. The young are born as fully developed, miniature versions of the adults, and immediately swim off in search of their first meal. Known as the world best 12-foot dive and coined ‚ "Stingray City"‚ by Geri Murphy in 1987. 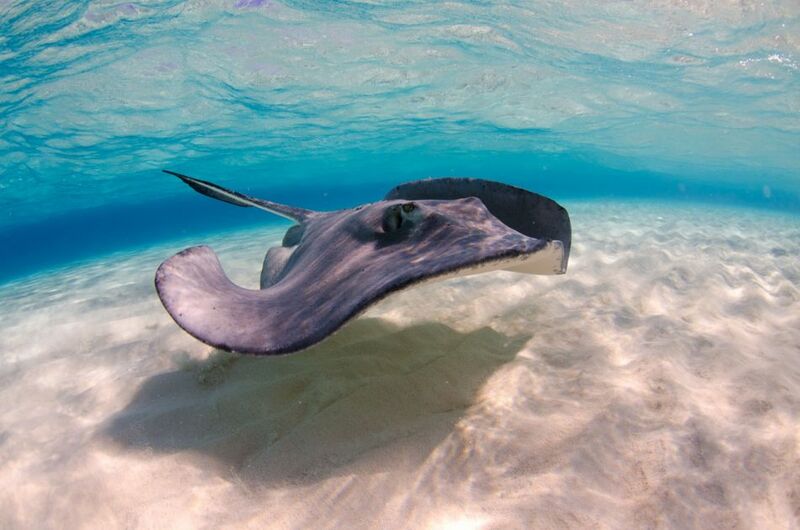 In the last 20 years, over 10 million visitors have experienced the Cayman Islands' Stingray sites and it remains the number one attraction and a must see for all divers. Not all stingrays are the same and there are about 200 species of stingrays in the scientific order 'Myliobatiformes'. 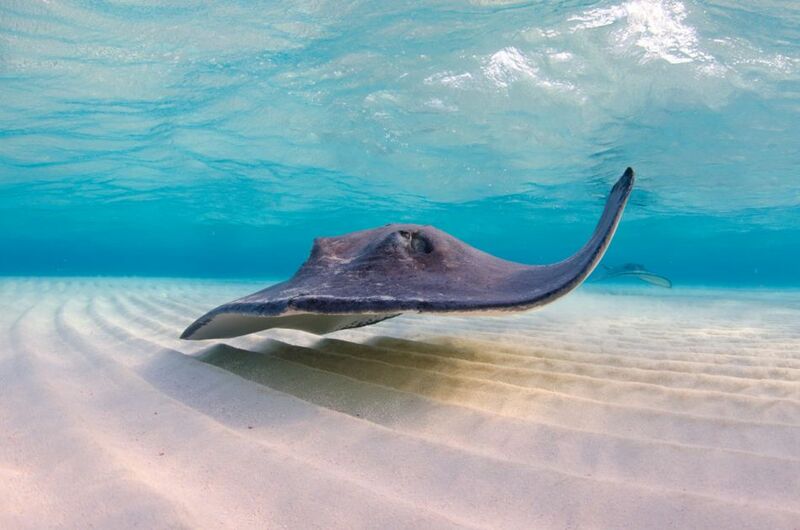 There are up to 175 individual 'Southern Stingrays' between the Stingray City and Sandbar sites. 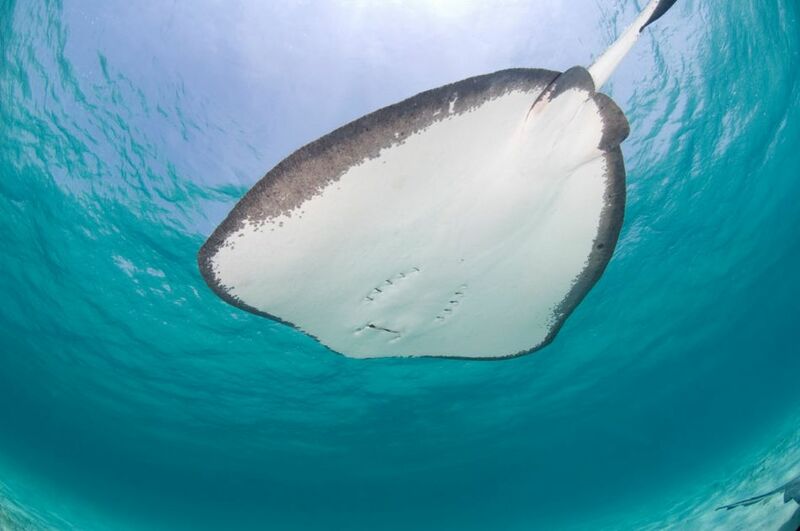 The rays range in size from 12 inches wide to over 4 feet and 125 pounds in weight. 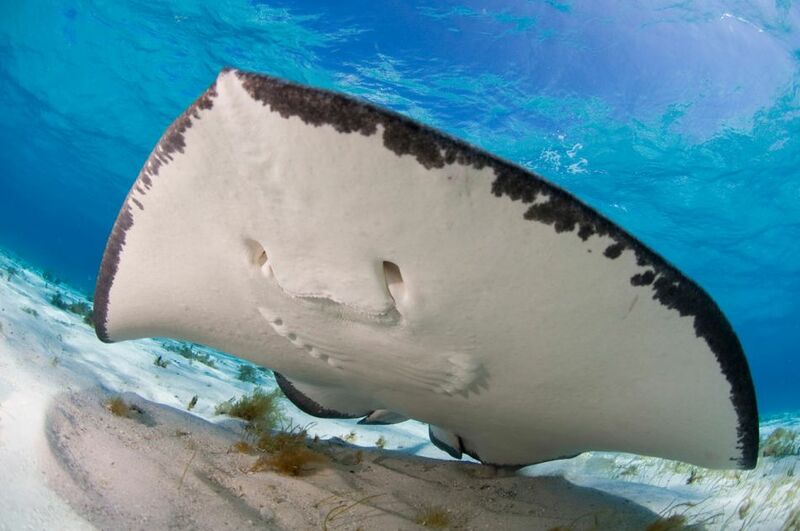 The majority of rays are females and are notably larger in size. 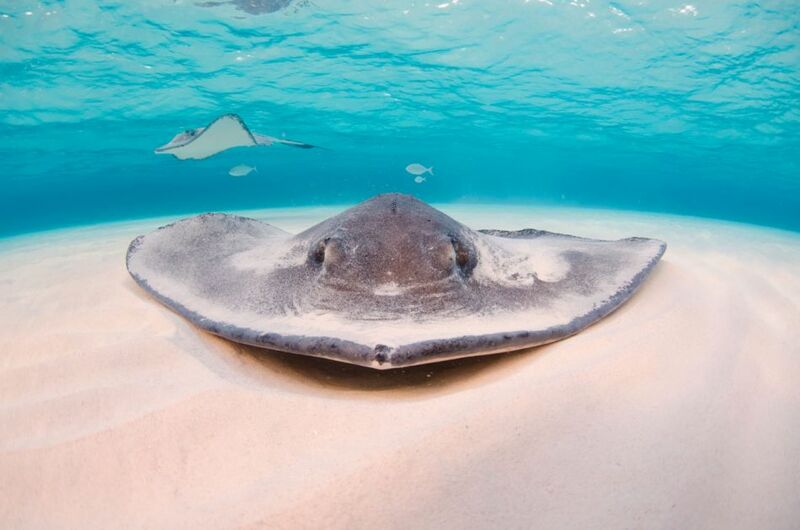 Southern Stingrays do not have any teeth and use suction and cartilaginous plates to extract and ingest their food. The rays can easily be hand fed by a technique similar to that of feeding a horse. 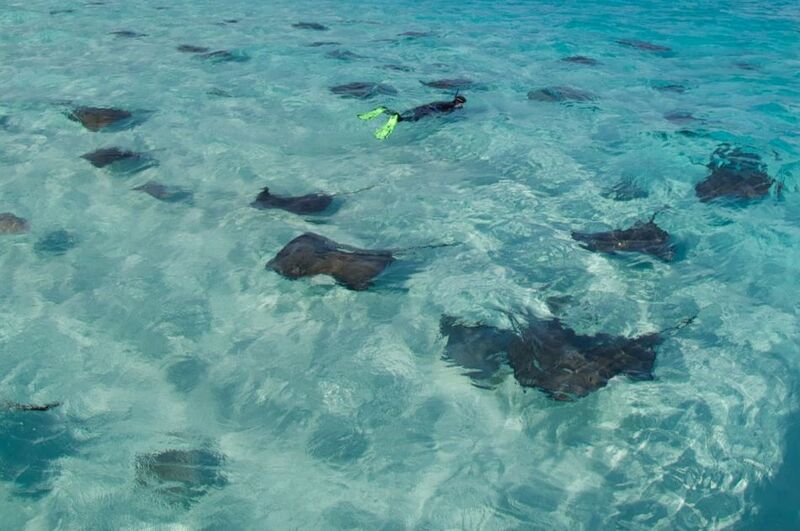 Dive and Snorkel operators interact with these stingrays in a completely wild and open environment. 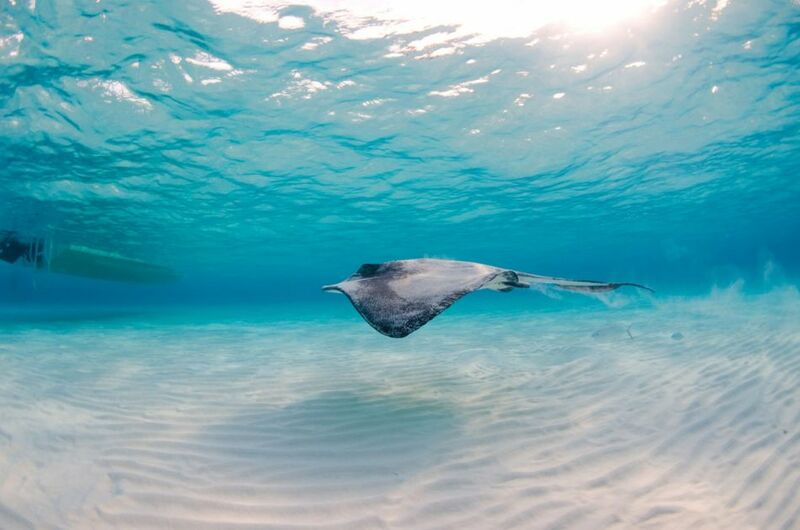 The rays choose to interact with divers and snorkelers and are free to leave anytime they wish. 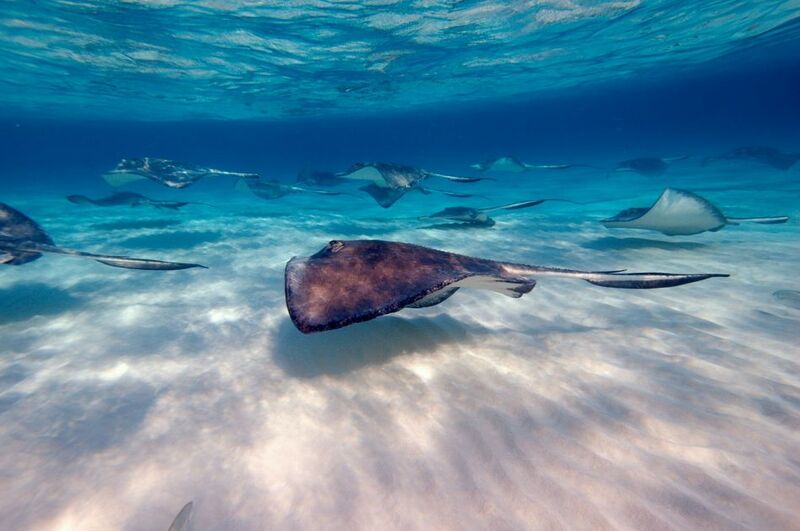 The Cayman Islands Stingrays welcome each and every visitor that comes to see them, leaving an indelible memory of their soft underbelly touch that brushes your legs as they glide by. 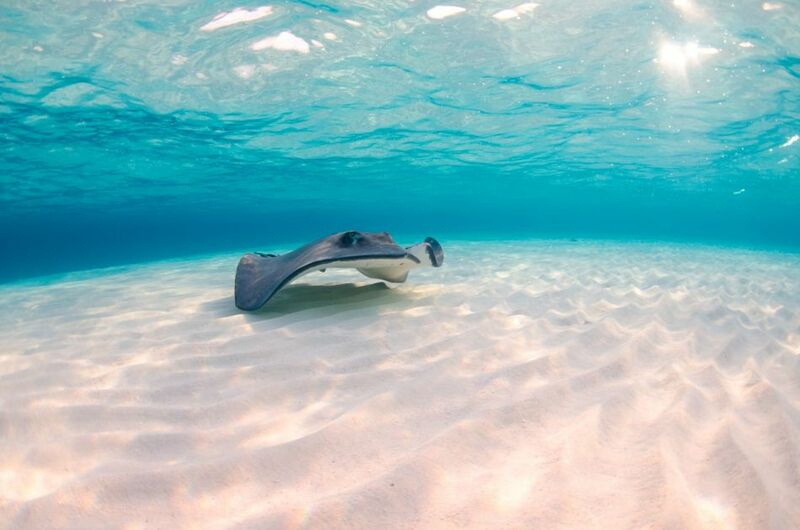 Stingray City is the site to dive with the stingrays that is suitable for all ages and all experience levels of diver. 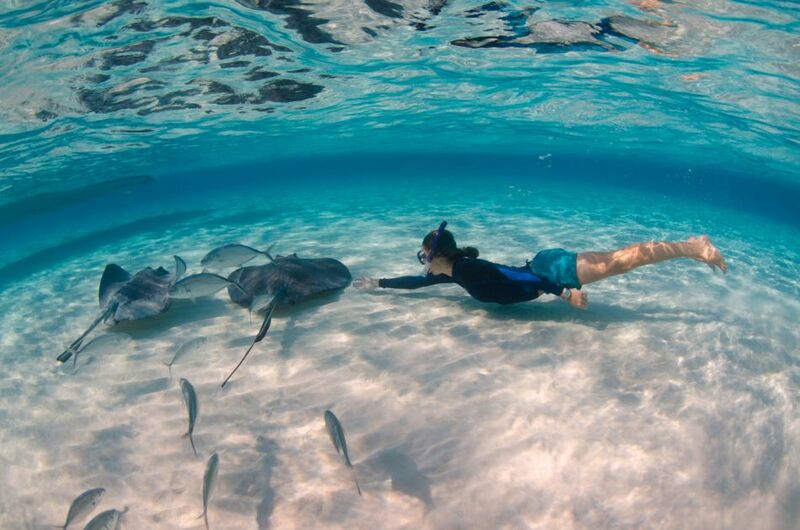 The Sandbar is the site that is suitable for snorkleing with the stingrays. The conditions are typically very calm due to its protected location inside the fringing reef. This is a great site to visit with the whole family and especially rewarding for underwater photographers. A boat is required to reach each site as they are located in the North Sound (shallow lagoon) about 2 miles from the shoreline. Ocean Frontiers offers trips every Friday. Our trips depart from the Kaibo Yacht Club near Rum Point. 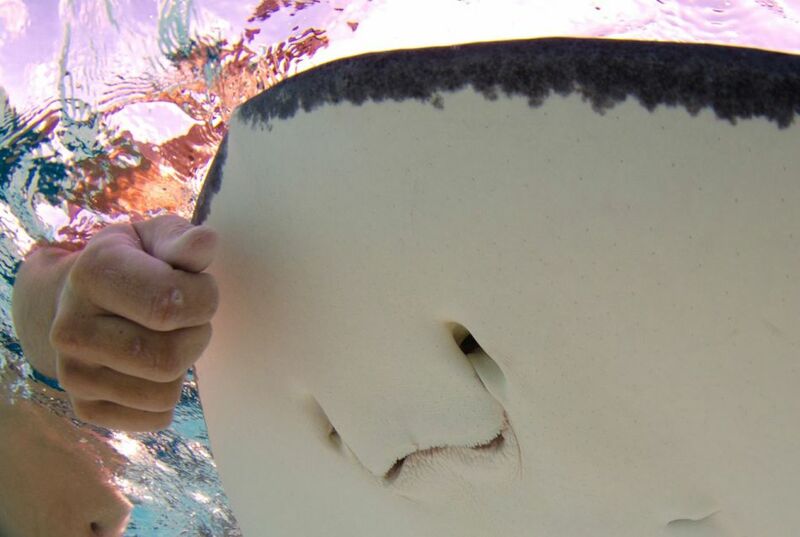 The friendliness of our Stingrays is only matched by the friendliness and warmth of our staff.